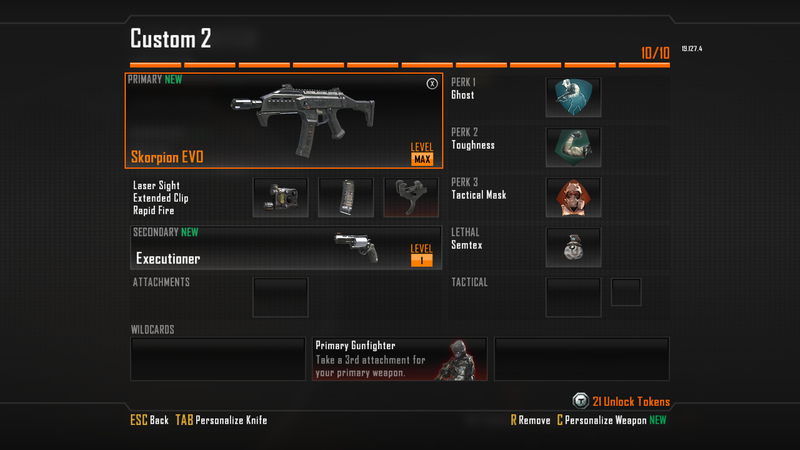 The Scorpion EVO Sub Machine Gun is the last sub machine gun you unlock in Call of Duty Black Ops 2. It has a very high fire rate and good hip fire characteristics so it lends itself well to only using the hip fire, with a few modifications to the weapon. This guide explains what the best strategy with the Scorpion EVO is and what the best class setup is. The Scorpion EVO is the sub machine gun with the highest fire rate and best hip fire characteristics. So the best way to use it is to only using hip fire. Since I am going to recommend to use rapid fire aiming down the sights of the Scorpion EVO is only doable if you burst fire and then you are going to be beaten by every other gun in the game. When you do encounter an enemy start hip firing and strafing at the same time. A big advantage to using hip fire is that you can move much faster, so strafing is a powerful tool to win those gun fights. You have to use the Scorpion EVO in a similar way you would use a shotgun. However, the Scorpion EVO does have more range and is at its best at medium range just outside of the shotgun’s effective range. When you move around the map think about the route you are going to take and use the one with the most close quarters since you are strongest in those. When you see an enemy with a rifle at long range behind some cover flank him to force him into close quarter combat where you are much better than at long range. To get you to the enemy flank undetected use Ghost. However, it is interchangeable with Lightweight which helps you get there faster and makes strafing a bit more effective. When you are firing at an enemy and they fire back you are going to start missing due to flinch. Toughness helps reduce the amount of flinching you do to get more bullets onto your target. Because you are near the middle of the fight there will be a fair number of tactical grenades and equipment around, so using Tactical Mask helps reduce the impact they have on you. You have to give up either a lethal or tactical grenade. I went with the lethal grenade option. If that is your choice be sure to use Semtex because you are going to be in close quarter combat a lot and Semtex blow up faster. If you go for tactical grenades go with your preference, but I suggest it is one of concussion or flash grenade. A secondary is good with the Scorpion EVO, especially since you are going to empty out your magazines very quickly. When you run out you can switch to your preferred secondary and take the target out. Hip fire gets better the more bullets you shoot. Rapid fire buffs your fire rate to an even more ridiculous rate. But that will empty your magazine even faster, so using extended clip lets you keep pulling the trigger for a little longer. Since you are always going to be hip firing Laser Sights helps with every kill as it makes your hip fire accuracy better. This entry was posted in CoD: Black Ops 2, Weapon Guide and tagged best Class Setup, Best Strategy, Black Ops 2, Call of Duty, Call of Duty Black Ops, Call of Duty Black Ops 2, close quarter combat, close quarters, fire rate, gaming, Hand grenade, Scorpion EVO, Scorpion EVO Best Class Setup, Scorpion EVO Best Strategy, Scorpion EVO Guide, Scorpion EVO Weapon Guide, Semtex, Strafing, Submachine gun, videogames, Weapon, Weapon Guide. Bookmark the permalink. 2011 年 10 月 04 日 下午 2:44I have found your blog long ago and continue rednaig it up-to-date! But now I have decided to register and write a comment for those who are here for the first time! Do not pass by!! Do not look at the site design! The content is surely what you need from this topic! Stay with us and enjoy! I use the Suppressor and Foregrip: Makes for a good combo for any ranged combat and I can just hip-fire to eliminate enemies at close range. The Skorpion is surprisingly accurate once you have it’s recoil under control, so I’m not going to use this.